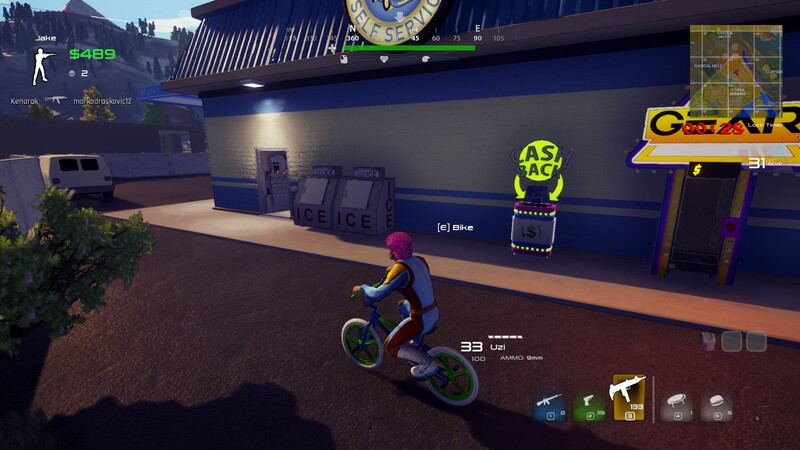 Radical Heights is so incomplete it feels almost cynical on the part of Cliff Bleszinski, a man so good at creating shooters, he manages to get them to feel just right no matter what stage of development they're seemingly in. Everything Bleszinksi touches, you see, turns to gold. There's Unreal, Gears of War, and even Lawbreakers, Boss Key's previous game that somehow failed to find even a handful of players despite being phenomenal. 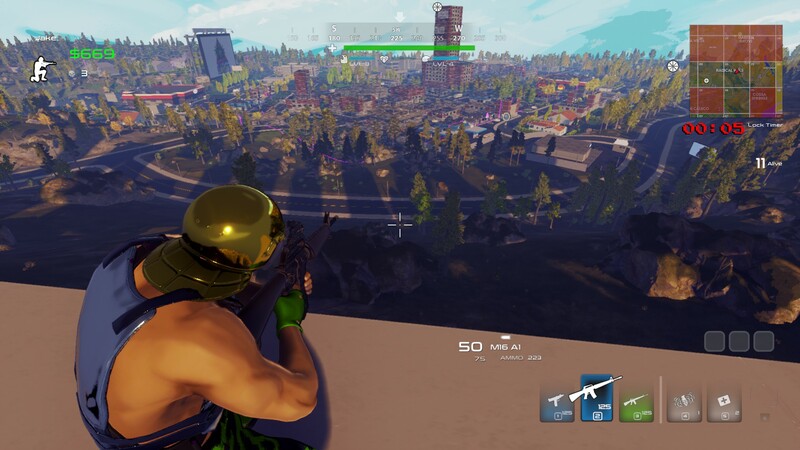 Whispers around that game suggested that it was the explosion of battle royale titles that killed the beast, and now, after both PlayerUnknown's Battlegrounds and Fortnite Battle Royale have made megabucks, Bleszinski himself seems to have taken a swing with 80s-themed, free-to-play battle royale title Radical Heights, a game that's so Early Access, half of the buildings in the game's map are still untextured greybox. This isn't hyperbole. 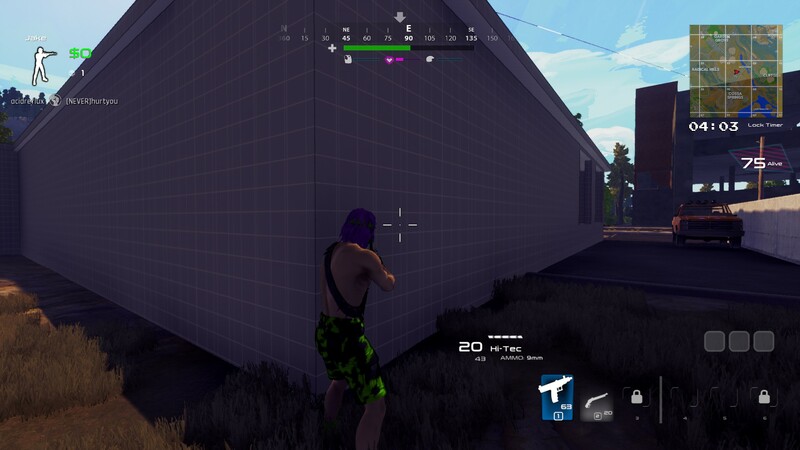 There are actually untextured buildings littered around the map, as if the team were so eager to get it out for waiting players that it didn't care enough or couldn't wait long enough to actually texture it. 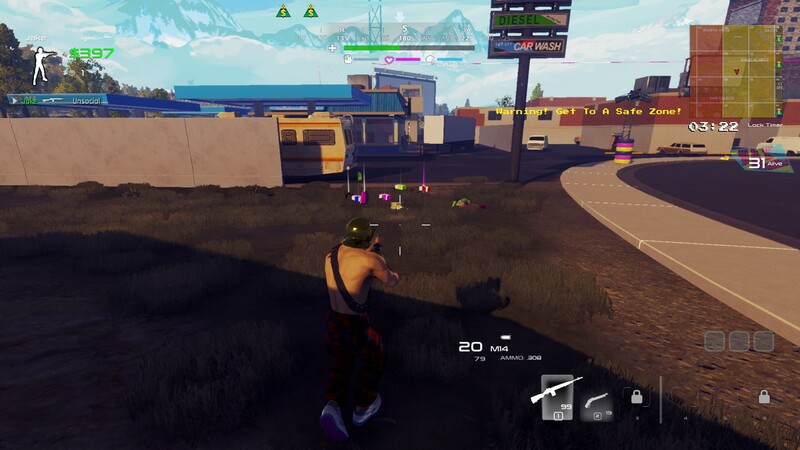 Usually, this would set the game up for ridicule and it'd sink without trace, never to be mentioned again if not for the fact that, while I'd never attribute a game's success or failure to one specific person, it does rather appear that Cliffy B and Boss Key have done it again, making the actual shooting part of Radical Heights one of the most satisfying in the entire genre. 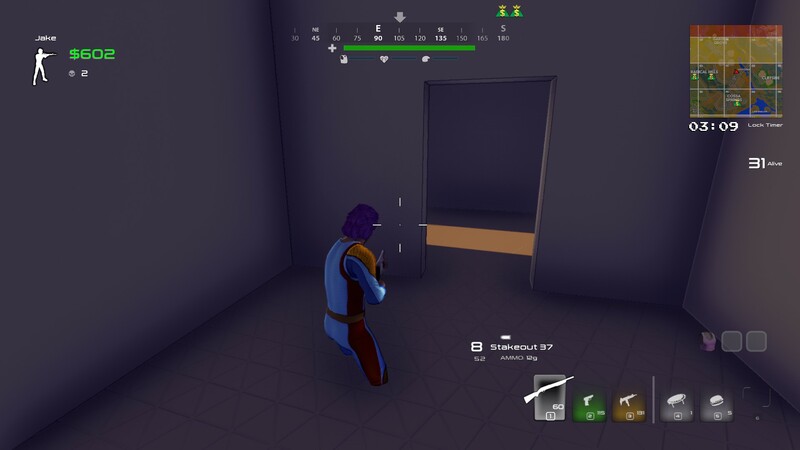 As an arcade battle royale experience goes, this is as good as it gets in terms of guns: It's solid and tactical, and every bullet you put into a target feels satisfying, but the game is simple enough that you don't need to put any real effort in to learn everything before you have a good time. Because of this, I can't stop playing it, even though the game is clearly barely even in alpha. I'm enjoying it so much that I'm typing this sentence in the lobby while queuing for another match, but it's so buggy that there's a pushbike glitched out and spinning in perpetuity on its saddle. So. let's try radical honesty on Radical Heights, shall we? Radical Heights' core concept is pretty interesting: It's an 80s set gameshow, an aesthetic that paints the world and cosmetics within it, and creates a series of interesting play decisions: Cash is king here and can be used to buy weapons in vending machines across the map, or to buy cosmetics out of game. ATMs across the play area allow you to pull money out for an early boost or store away some of your nest egg, as it decreases substantially when you get killed. 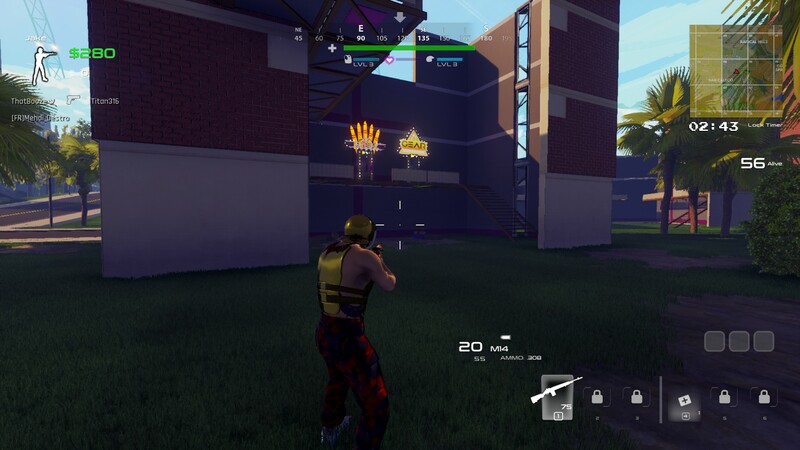 Some of the best weapons and armour are only available through taking part in some of Radical Heights' gameshow conceits. Standing in front of a prize window will see it slowly open, playing a loud noise that marks you out as a stationary target. Spin-to-win machines fall from the sky, dropping weapons on those brave or stupid enough to stand directly underneath the machine, perfectly lined up for a headshot from any watching snipers. Loot, then, takes several forms. There are weapons and gear, which I'll get into later, cosmetics that can be bought for in-game currency permanently as soon as you discover them in-game, and also prizes: a VCR, a games console, or a big ol' chunk of cash. This is largely money which you can, again, use to buy stuff in-game from vending machines or keep hold of to spend on cosmetics between games. 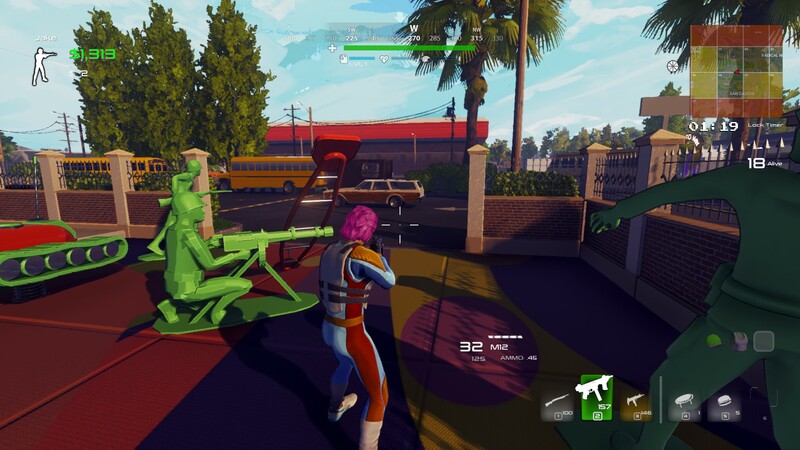 It's a small part of the overall game but a nice addition to help Radical Heights stand out from the teeming mass of battle royale pretenders. Unfortunately, in many ways Radical Heights doesn't go far enough to showcase its personality. Beyond the huge, looming Radical sign, the actual map itself is largely boring and feels like a huge placeholder until the developers can find the time to inject something nicer. Similarly, the fact the game has no fall damage means that rather than parachuting down to earth you just hit the ground in a combat roll and come up looting - that's exciting and a cool flourish, but these touches of actual personality are few and far between. One moment that works incredibly well, though, is the game's trampoline. The trampoline functions like a grenade-jump, letting you toss it onto the ground ahead of you to reach usually inaccessible areas or to spring into the air for vision. Using the trampoline is fun, and providing you can get back to where you originally tossed the trampoline down, it's reusable too. Otherwise, much of the gear is stuff like an enemy locator, inflatable decoys, and confetti grenades. It's fun enough but isn't quite as exciting as using a trampoline to sail through the sky. The weapons are punchy, effective, and hit the balance between fun and easy to use. Putting someone down is often faster than you think, and a concentrated burst of gunfire will usually do it. Weapons come in a variety of shapes and sizes, but they're all mainstays from other movies and video games, so when you pick up a Dragunov or Stakeout, you'll likely be able to tell exactly what it does from the get-go. Better, weapon customisation is a joy. Weapons drop in one of several different levels, each progressively giving it more attachments and capabilities. A Level 1 Uzi is just an Uzi, while a Level 3 could have an extended magazine and a 2x scope, while a Level 4 adds a silencer into the mix, making it a very dangerous weapon in the hands of professionals. Honestly, much as it pains me to say it, even for a free-to-play game, I'm not sure Radical Heights is worth your time in its current state. While the core mechanics of the game are tight and fun, it's clearly incredibly rushed, and it's hard to generate real enthusiasm for a game that even Boss Key doesn't seem to care that much about. It could come good, but compared to the polished gem that was Lawbreakers, it's a shame to see the studio's next game be a half-arsed rush job, especially as the lack of polish and rough edges all but obscure a lot of the great ideas Radical Heights has.